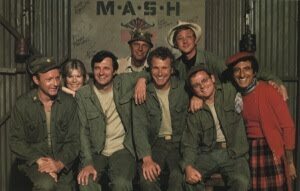 Those of you who know me, know that I am totally and completely addicted to M*A*S*H. Yes, I know the final season was nearly thirty years ago. And yes, I know it’s a bit over the top to use the theme song as the ring tone on my cell phone. But I can’t help it. M*A*S*H is simply the best. Beginning in March 2010, I watched the entire series, in order, from start to finish. It took three months. Although I’d seen most of the episodes over the years, I wanted to watch the entire series so that I could see the arc of each main character as well as the arc of the war. I wanted to share some of those lessons with you because I think they apply to writing. 1. Be careful with the back story. The writers were very crafty at only inserting back story as it was needed and pertinent to the scene or episode. The Pilot doesn’t begin with a list of characters, followed by each life story. We get it piece by piece, episode by episode. It makes the characters more compelling because the viewer thinks they might find out something new about a character at any time. For instance, even though we know Houlihan’s dad was career Army, we don’t know how tough he was on her until we he comes to the 4077th. It explains a lot about her constant need to fit in and her desire to be praised. 2. Keep a balance between humor and drama. Even though the front is only three miles from the 4077th, the characters are constantly playing pranks and getting off stinging one liners. If the show had only been gloom and doom, it wouldn’t have had an eleven year run. Viewers learned little about the nuts and bolts of the Korean War. Instead, we learned how people cope with a reality that’s so overwhelming. The show was about the people, not the war. 3. Know the difference between internal and external conflict. Even though the Korean War is the whole reason the characters are together, it’s really a small part of the show. It’s the driving EXTERNAL conflict of the entire show. However, the real cog is INTERNAL conflict. Hawkeye’s pacifist viewpoint clashing with the need to carry a gun, Frank’s struggle with his love for Margaret when he’s got a wife and kids at home, BJ’s conflict with his wife taking an evening waitress job because they need the extra money while he’s in Korea. The EXTERNAL conflict is easy and constant. The INTERNAL conflicts are subtle and are brought about, in many ways, by the character’s individual reaction to the external conflict. While the above lessons are all about craft, I learned one important lesson about the business of writing. 4. You’ve got to start somewhere. Lots of super-soon-to-be-famous people got bit parts on M*A*S*H. Patrick Swayze, Blythe Danner, Lawrence Fishburne. Thirty years later, these are all household names, but not so when M*A*S*H began. So hang in there. It just takes a while to get noticed. If any one’s hosting a M*A*S*H trivia party, call me. I’ll bring the martinis.
. . . and I'll bring the fudge made in a helmet! Great post, Lateia – from another M*A*S*H nut. Very interesting and a helpful reminder on all your points. Terrific Job! !